Brand New: 2 Bulbs total. 12V Drawing Input, 80W/100W Output. Xenon Bulbs - Look like HID lights! 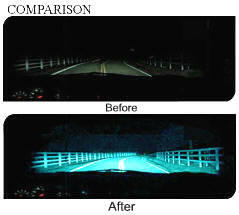 Improve Visibility, Nighttime Safety, Light Output, Styling, and add Value to your Vehicle! 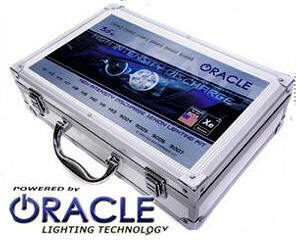 Oracle HID kits are the highest quality TRUE Xenon Conversion available. 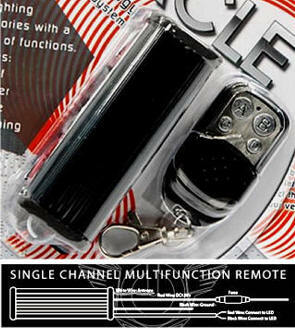 ORACLE Xenon Conversion kits were developed with strict standards and the latest technology available including NEW slim fully DIGITAL ballasts and a "Plug and Play" wiring harness. - Brackets, Extra Fuses, Connectors Etc. 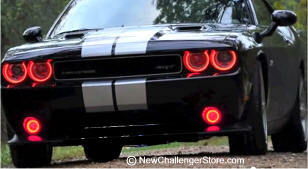 2008-2014 Challenger, H13 Bulb Stock. 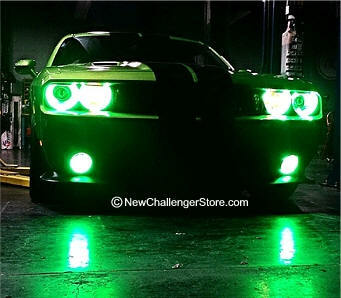 Convert your Head Lights into HID! WORKS GREAT! You'll be amazed! 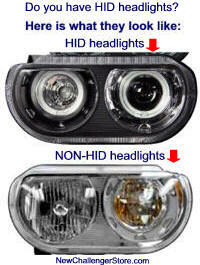 Mounts on the "Outside" of the headlight. 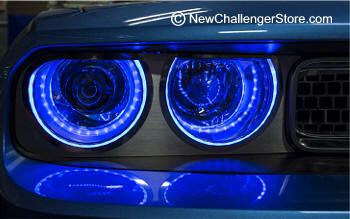 Surround your headlights in a brilliant LED glow with our Illuminated Headlight stainless steel Surrounds. Our surrounds provide a beautiful Brushed Stainless trim combined with a ring of intense LED illumination. 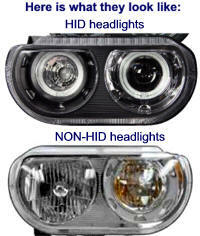 You DO NOT have to go inside your headlight lenses light HALO lights. 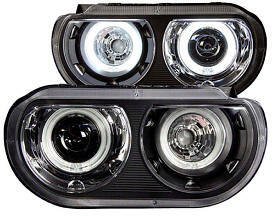 These easily mount on the outside of your headlights! 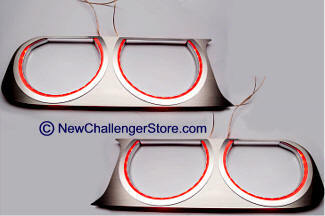 This set contains on illuminated ring per headlight, total of 4. Available in 5 LED color options, our surrounds are designed to fit around stock headlights and feature a simple wiring design which can be adjusted to suit your specific needs and install to either a switch or remote (sold separately). 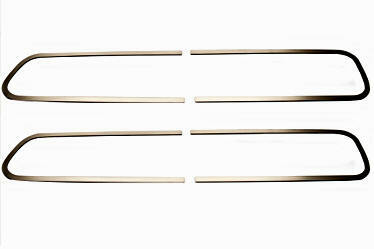 Beautiful brushed stainless rings - Shown with lights off. 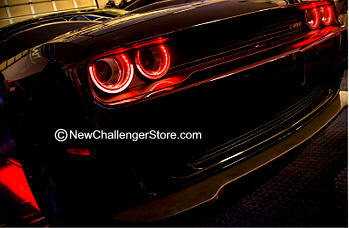 AAC-CHAL-8-HALO-HL Dodge Challenger (2008-Current) Halo 'Head Light' Accents "Demon-eyes"
Demon Eye Kit, this is a High Quality Product produced by the leaders of the industry. 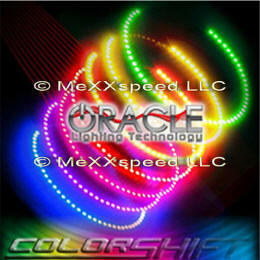 You may also special order LED style in Red, Yellow or Blue. Call us for that. Shown in Blue in CCFL. 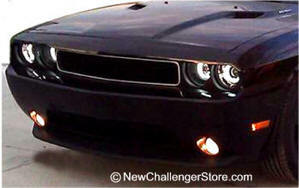 AAC-CHAL-8-HALO-HL-FL Dodge Challenger (2008-Current) Halo 'Head Light' & 'Fog Light' Accents "Demon-eyes"
Shown in White in CCFL. Enjoy the flexibility of selecting the color you want with the click of a button, choose from 4 demo modes that scroll, pulse, strobe, and fade into over a dozen colors! 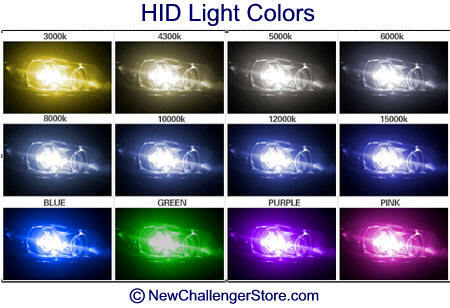 This is a guaranteed attention getter or use it to just tune the color of your choice. 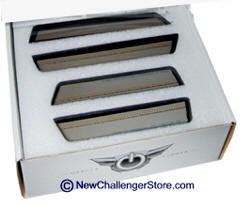 - (4)ORACLE ColorSHIFT Headlight SMD Halo Rings. 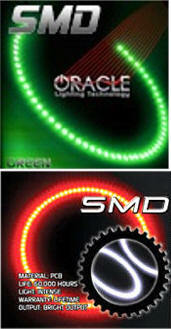 - (2)ORACLE ColorSHIFT Fog light SMD Halo Rings. 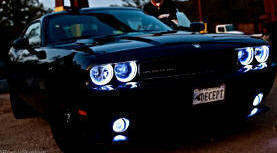 Do you have HID Lights? 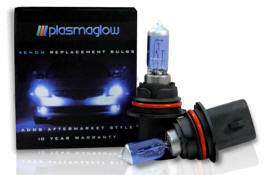 Simply remove your old headlight assemblies and plug these in. 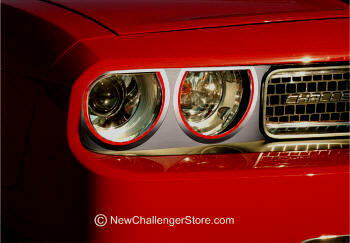 Oracle Headlights provide the infusion of light you need. Chrome housing. Whole Head Light assemblies with Halo's -ready to mount! Your item might look somewhat different than photos. 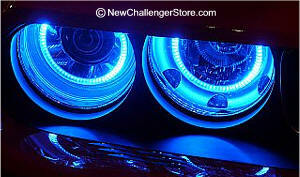 Simply remove your old Head light and Fog light assemblies and plug these in. 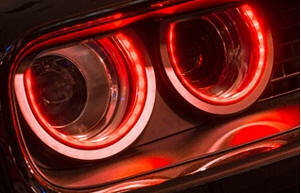 Oracle Head lights and fog lights provide the infusion of light you need. 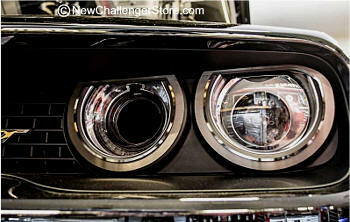 Whole Head Light assemblies with Halo's and Fog Light Assemblies with Halo's -ready to mount! 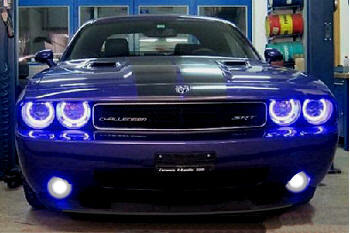 Send us your head lights and fog lights we and we will install. We send them back to you with the Halo's installed. You just plug them back in and your done. 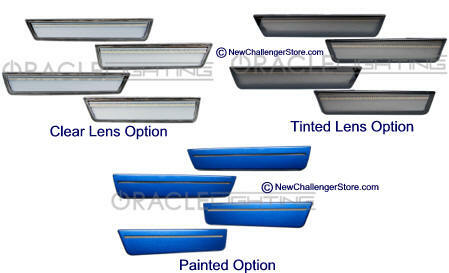 Purchase whatever HALO lights you want then purchase this service. Send us your lights. 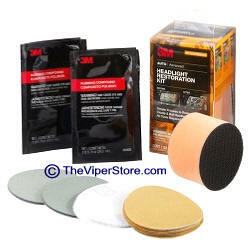 Be sure to insure the package for the full value of the lights. 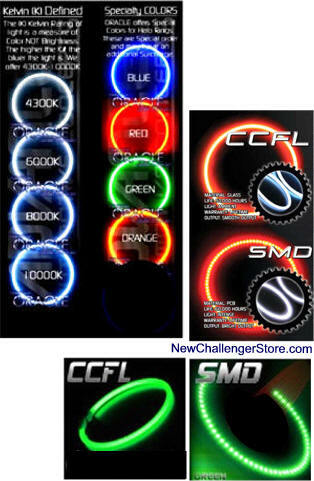 Concept SMD Side-marker lights are complete side-marker replacements fitted with high powered 3528 Bridgelux LED's that produce a laser-like appearance. Installation is easy! Just pop out the factory side-markers and connect the new ORACLE Concept Side-markers right into the stock plugs. 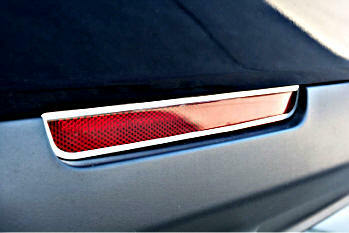 Illuminate your ride with the intense style of Anzo USA LED Tail Lights. 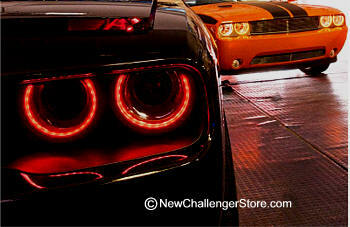 Customized to fit your vehicle perfectly, these bad boys are a direct replacement for outdated and boring factory lights. Anzo USA uses state-of-the-art CAD/CAM equipment to produce some of the best-fitting and best-looking tail lights on the road today. Whole assembly in LED lights! 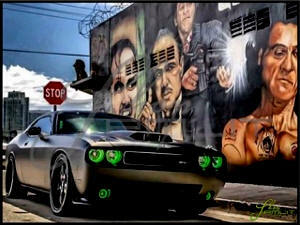 WESOME! 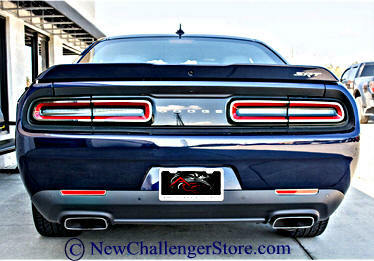 These Challenger sequential taillight kits will convert the taillights on your 2009-Current Dodge Challenger into Sequential Turn Signals. 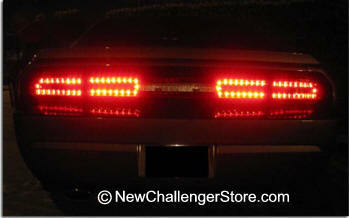 This Challenger sequential tail light kit contains pre-wired, plug-in harnesses that install with no wire cutting or splicing of any kind! Does not fit on 2015 or newer models. SUPER COOL! It's the Gotta Have item! 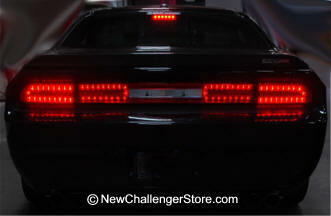 The Third Brake Light Pulser module can give you the extra measure of safety you need. 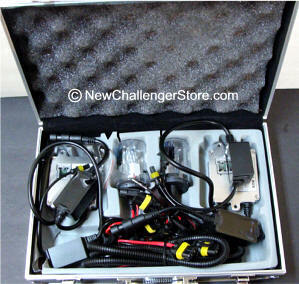 These devices are full "Plug-N-Play" harnesses that simply plug into your existing Center High Mount Brake Light. There are no wires to cut, and no adjustments to make. (notice how you can see it flashing, even while reading text down here!). The "Delay-Repeat" circuit means the brake lights have to be off for at least 15 seconds before the cycle can be restarted. 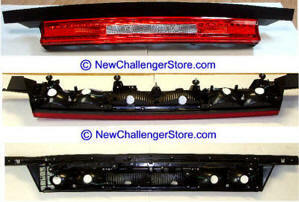 So, if you are in bumper-to-bumper traffic, the brake light isn't always pulsing. 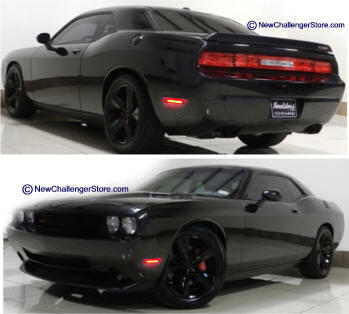 Turn your American made muscle car into something more. 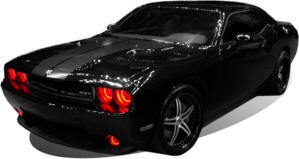 These attention getting stainless steel Tail Light Trim for your Dodge Challenger will create a unique, high quality look. 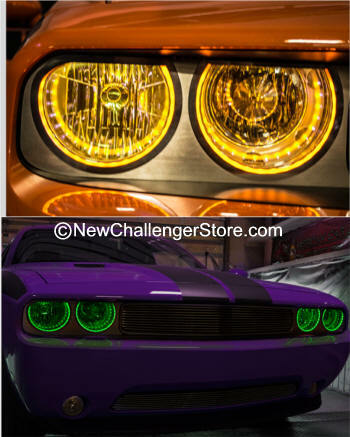 Because that's the only grade of materials we use and it's the only type of product you should be putting on your Challenger. 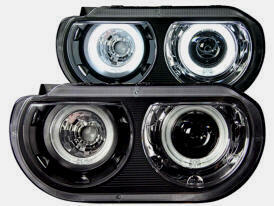 W48.0000" x H9.0000" x L5.0000"